Empanadas are the quintessential hand-pies. These ones are full of flavour with a hint of spicy heat for good measure. To make the chicken and olive filling, put the chicken in a small saucepan and add enough chicken stock to just cover. Bring to a simmer over medium heat, reduce heat to low and poach gently for 15 minutes or until tender. Remove the saucepan from the heat and cool the chicken in the stock for 30 minutes or until cool enough to handle. Meanwhile, heat the oil in a medium saucepan and cook the onion over medium heat for 10 minutes or until soft. Add the garlic, paprika, cumin and chilli and cook for a further 2 minutes or until aromatic. Add 60ml (¼ cup) of the chicken stock to the onion mixture with the olives and raisins and cook over medium heat for 5 minutes or until the raisins are plump and the excess liquid has evaporated. Transfer to a heatproof bowl. Remove the chicken from the stock (reserving the stock) and use your fingers to shred into small pieces. Add to the onion mixture with 1 tablespoon of the reserved stock and stir to combine. Taste and season with salt and pepper. Place in the fridge for 20 minutes to until cooled to room temperature. To make the empanada dough, combine the flour, salt and butter in the bowl of a food processor and process until mixture resembles fine breadcrumbs. Add the egg and 4 tablespoons of the iced water and use the pulse button to process until mixture just comes together in a ball, adding the remaining 1 tablespoon of water if necessary (the dough should be soft but not sticky). Turn onto a lightly floured surface and knead lightly until smooth. Divide the dough in half, shape each portion into a disc, wrap in plastic wrap and place in the fridge for 20 minutes. Preheat oven to 200°C (180°C fan-forced). Line two large baking trays with non-stick baking paper. Use a lightly floured rolling pin to roll out 1 portion of the dough on a lightly floured surface until 3 mm thick. Use a 9 cm plain round cutter to cut out 12 rounds, re-rolling the pastry if necessary. Brush the edges of the pastry rounds with a little of the egg wash. Place about a tablespoon of the cooled filling in the centre of each round and then fold the pastry in half to enclose the filling, pinching the edges to seal. Pleat or press the edges with a fork to decorate. Place on the lined trays. Repeat with the remaining dough and filling to make 12 more empanadas. Brush the tops well with the whisked egg. Bake in preheated oven for 30-35 minutes or until deep golden and pastry is cooked through. Serve warm with the sour cream for dipping. • The chicken and olive filling can be made up to 2 days before using. Keep in an airtight container in the fridge. • The empanada dough can be made up to 4 days before using. Wrap well in plastic wrap and keep in the fridge. Stand at room temperature for 45-60 minutes or until soft enough to roll. • The uncooked empanada’s can be kept in an airtight container, separated by baking paper, in the fridge for up to 2 days and for up to 1 month in the freezer. Bake straight from the fridge or freezer, adding 5-10 minutes extra baking time. 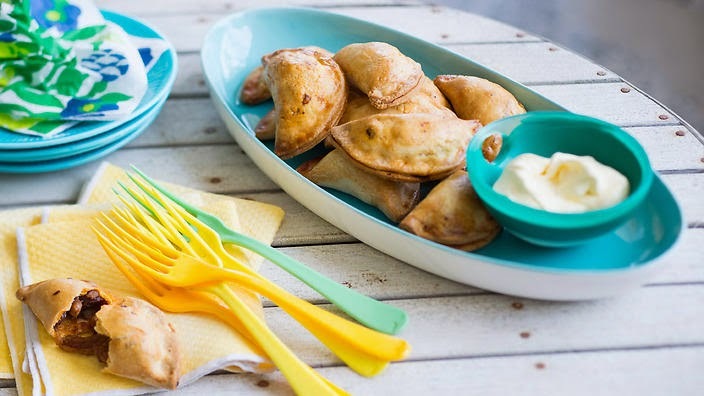 • The cooked empanada’s can be kept in an airtight container, separated by baking paper, in the fridge for up to 2 days and for up to 1 month in the freezer. Reheat on a baking tray lined with baking paper at 180°C (160°C fan-forced)for 10-20 minutes or until heated through and the pastry is crisp. Anneka's mission is to connect home cooks with the magic of baking, and through this, with those they love. Don't miss what's coming out of her oven via Facebook, Twitter, Instagram and Pinterest.